Bleach Episode 366, the very last episode of the Bleach Anime. Knowing this was coming didn’t make it any easier at all, and as such the episode as a whole felt very bittersweet. I had a feeling I was going to spend more time going over my thoughts on Bleach as a whole rather than this episode, so to prevent doing so, I do plan to write up something seperate explaining about my thoughts and feelings on Bleach in general. So yes, putting my feelings to the side for now, it’s time for the actual review of this final episode. 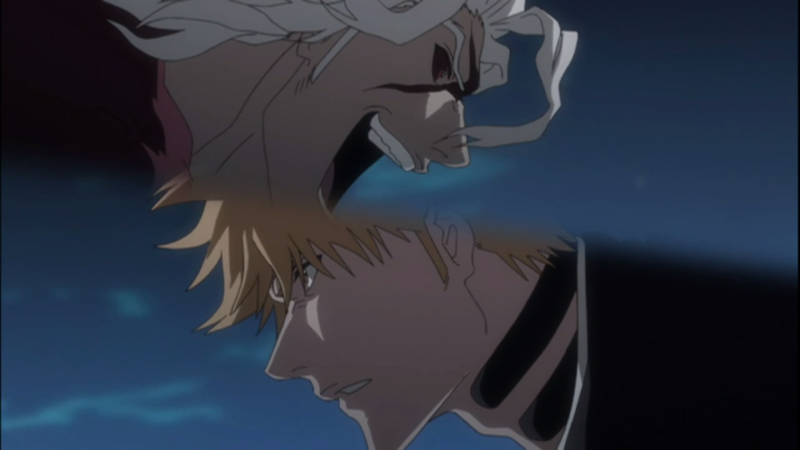 The episode starts with Ginjo and Ichigo continuing their fight from the previous episode, with both in Bankai and both doing their best to come out the winner. It doesn’t take long though before Ichigo starts landing hits on Ginjo, slicing him pretty good and spilling his blood. Ginjo tries to keep up, but is ultimately outmatched by Ichigo who eventually lands the finishing blow on Ginjo, sending him crashing back down to the ground. As Ginjo lays there dying, he wonders how things would have been if the roles had been reversed, with him being in Ichigo’s current position while Ichigo would have been the one who felt betrayed by Soul Society. Ichigo silently stands beside Ginjo, only for the sudden appearance of Tsukishima who aims his sword straight for Ichigo who is caught off guard. Rukia throws herself in the way, and Riruka emerges from her and takes the slice instead. She calls Tsukishima stupid, and says that even though Ginjo was the one who saved all of them, that they were unable to do the same for him, and that in the end Ichigo was the one who saved him. Tsukishima himself of course is gravely injured, and his vision starts going blurry, while also coughing up blood as he falls to his knees. Tsukishima remembers how back when he was a kid Ginjo came along and said the two of them could stay together, and then in his mind questions why Ginjo taught him everything except for what to do when he would die. As Tsukishima is doing so, Shishigawara suddenly appears. Shishigawara sees how badly Tsukishima is injured and so carries him on his back, while saying how Tsukishima is the strongest of all, that he can’t die, and that he is invincible. Tsukishima then realises that Shishigawara is feeling the same way now as Tsukishima is about Ginjo. Tsukishima smiles and thanks Shishigawara, while Shishigawara says as Tsukishima’s apprentice this is the least he can do, all the while tears are streaming down his face. They are going through some woods, and as they come in to a clearing the sun comes out signalling that morning has arrived. Shishigawara tells Tsukishima to look and says how nice it looks, while Tsukishima smiles and then seemingly dies. We then get to see Yukio elsewhere walking away, and being approached by Jackie. This scene differs from the Manga, nothing too major, just that in the Manga Yukio tells Jackie that in a few years when he gets some things done that he will come back or offer them to come back together with him (or something along those lines). The episode swiftly moves on then in the second half, we see Riruka wake up in Urahara’s store and be pretty much healed. As she wakes up, we see Orihime led nearby who starts crying with joy when she sees that Riruka has finally recovered and woken up, and then silent tears come from Riruka as well. Meanwhile, there are reports around Soul Society that Ichigo has entered, and nobody there knows for what reason. Kyoraku sits down beside Ukitake and briefly asks about it, and says that he wouldn’t be surprised if Ichigo was furious and had come to return the Substitute Shinigami badge. It’s a pretty funny moment then as we get to see Ichigo walking towards the entrance of where Yamamoto is, and Renji is waiting there, only for Ichigo to walk past and casually greet him as if nothing happened. In any case, we find out that the reason Ichigo had come to Soul Society was to retrieve Ginjo’s body, as he wanted to give him a proper burial in the human world. Ichigo goes in front of all the captains (including the return of some familiar faces who I won’t mention just in case you want to find out for yourself) and Yamamoto himself. He explains what he wants to do, and is questioned about whether he knows the ramifications of what he is asking. Ichigo says he doesn’t give a damn about any ramifications, and that the reason he wants to do this for Ginjo is not because he has necessarily forgiven him for his crimes, but because he is a fellow Substitute Shinigami. Surprisingly, Yamamoto agrees to the request, while Rukia realises just how much Soul Society has changed thanks to Ichigo and just how mature he has become. We then see Ichigo heading back to the real world while some nameless guys from Soul Society carry the body of Ginjo. As Ichigo reaches the gate, he turns around and says goodbye to Rukia. Rukia says that he always seems to be saying that to her, with Ichigo acknowledging it and merely replying that he will see her again sometime. The credits begin to roll then and the ED music starts to play, but instead of the usual credits we get to see Ichigo entering the human world and being greeted by all of his friends and family, as he stands out looking over them all. I know I missed a couple of bits and pieces out, but I don’t want to be typing much more for the sake of a summary. In any case, while not my favourite episode, I still did enjoy this quite a bit. It yet again felt very rushed, you could tell they tried to cram a lot of information and events in to a short time. I actually felt bad for the Anime team having so little time to work with, if only the series could have lasted a month longer then the Fullbring arc could have had a proper unrushed last few episodes instead of what we have now. I can’t help but recommend the Manga for this arc (and, well, the current arc as well if you wish to continue the story since the Anime ended). The Manga did things better and explained things more where there were no time restraints, so you may want to check that out at some point. With that said, the team did a fantastic job with what little time they had. They managed to fit everything in to end the arc, and as far as rush jobs go this is about as good as you will see / get. I am still shocked and saddened by the Anime ending, and throughout the episode was an overwhelming sense of that more than anything which admittedly hindered my enjoyment somewhat. This episode was a decent enough end to the series though, and I am hoping that, as Ichigo said to Rukia, that we’ll see them again sometime. As we enter the penultimate episode of Bleach with episode 365, there is undoubtedly some sadness attached to both the episode and this review. It’s hard to think that after all these years, next week will be the last episode of Bleach. But anyway, I suppose I should just get on with reviewing this episode. Last week I was left disappointed by Byakuya vs Tsukishima and was very critical of it, but this episode was pretty awesome thankfully. This episode was almost entirely focused on the battle between Ichigo and Ginjo, with Ginjo dropping a couple of bombshells before too much of a real battle takes place. Firstly, Ginjo reveals that Tsukishima is on the verge of death, and says that since all of Ichigo’s friends and family will have their original memories restored because of it, Ichigo has no real reason to consider him his enemy any more. Ginjo then tells Ichigo the secrets of the Substitute Shinigami badge he carries around with him, saying that Ukitake had lied to him by saying it was some kind of combat pass. In actual truth, it was a tool Soul Society used to spy on Ichigo as it allowed them to keep track of exactly where he is as well as having control over his Reiatsu. Clearly Ginjo revealing all this stuff about the badge and its real purpose was designed to throw Ichigo off balance, with even Ishida shouting to Ichigo not to listen to Ginjo. Ichigo no longer stays silent and shouts out “Shut up!”, and then enters in to Bankai mode. Ginjo asks Ichigo if by doing that he thought it would make him be quiet, and asks if it means he didn’t want to know and wanted to continue living with his head buried beneath the sand. Ichigo however says that he wasn’t telling Ginjo to shut up, he was talking to Ishida. I actually found that pretty funny and there were a couple of funny moments like that between Ichigo and Ishida, but I digress. Ichigo is then in Bankai mode, but before any kind of fighting takes place, he tells Ginjo that he figured out about the badge himself long ago. Ichigo says that Ukitake is a much smarter person than he is, and that if he wanted to really do something like that to spy on Ichigo, he would have done it in a way that would have been impossible for him to notice. Ichigo talks about how all he has ever wanted is the power to protect his friends and family, and that first thanks to Rukia he gained his powers, and then when he lost them Soul Society helped him get them back again, and that all he cares about is protecting. Ginjo realises that there will be no way of changing Ichigo’s mind, and so says that he has no choice but to destroy him. Ginjo then enters Bankai himself, and with a massive blast of energy his appearance changes (as you can see in the above picture). Ginjo and Ichigo, both with their own Bankai, begin to charge towards each other in what is to be their final battle. I enjoyed this episode quite a bit, Ginjo having Bankai was awesome as was Ichigo’s. Ichigo vs Ginjo while both in Bankai mode is amazing, and it looked amazing in the Anime as well. Full credit to the Anime team, as they have mostly done a great job with the episodes in this arc. Next week will be wrapping up this arc since it’s the last episode, and it does pretty much confirm my suspicions that it was the reason they rushed Byakuya vs Tsukishima, since it gave them more time for Ginjo and Ichigo. But yes, this was another fine episode during the Fullbring arc, and I can imagine what a bittersweet experience it is going to be next week when I watch and review Bleach for possibly the last time. I have to apologise to the people who regularly follow my Bleach reviews. For weeks I spoke of how good Byakuya vs Tsukishima would be and how good an episode it would produce, but episode 364 has instead proved a letdown. If you’re an Anime only viewer, maybe you won’t feel so negatively towards the battle or the episode itself, but as someone who has read this in the Manga I can’t help but feel letdown. To be honest the episode as a whole seemed very rushed, and I have a horrible feeling they are rushing just to try and get this arc finished before the Anime ends in a fortnight’s time. Byakuya vs Tsukishima especially seemed very rushed, whereas in the Manga things went at a better pace, and made the battle seem much closer and Byakuya’s win much more difficult and well earned. More time was spent on Rukia vs Riruka which is annoying considering it was pretty much a joke and the worst fight between the Fullbringers and the Shinigami, and this is coming from someone who likes Riruka and is also huge Rukia fan. It was pretty cute and funny when Rukia was first crushed by the stuffed bear, but it went downhill as soon as she was trapped inside a stuffed toy herself. We did get to see why the other Fullbringers all became friends with Ginjo and Tsukishima, but aside from that the whole thing was pretty boring. I know this review has come off as incredibly negative, and to an extent that is the feeling I have towards the episode, but it was far from the worst episode Bleach has ever put out. It just seems a lot worse for me (and probably anyone who has read the Manga chapters) to see such a brilliant fight pretty much butchered and ruined, and so it left a bad taste in the mouth as a whole. If you haven’t read the Manga, then this is probably an ok episode. If you have and liked Byakuya vs Tsukishima, then you will inevitably end up disappointed too. For me personally, this is one of the worst episodes of the Fullbring arc. 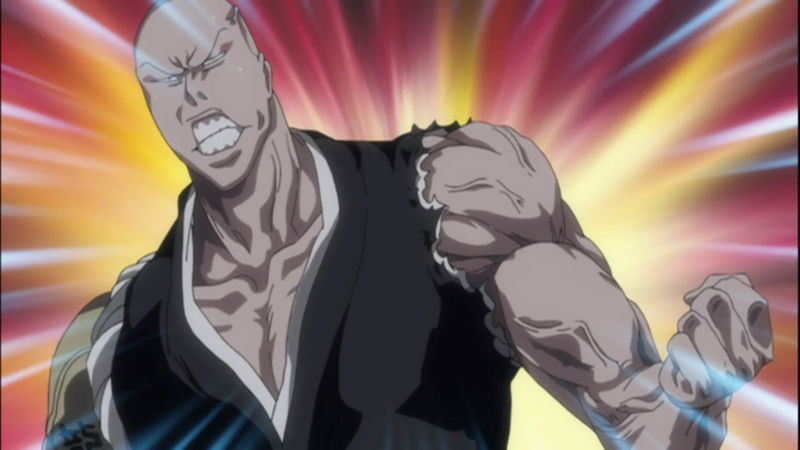 Episode 363 of Bleach is almost as memorable for the hilarious faces Ikkaku pulled as it is for the rest of the scenes, but even so, Bleach pulls out another fine episode here. Last week we saw the start of Xcution vs the Shinigami, with only Kenpachi’s battle decided then and there. This week, we see the battles between Renji and Jackie, Hitsugaya and Yukio, and Ikkaku vs Shishigawara all concluded. Truth be told they were all very easy and the Xcution members were basically embarrassed by the far stronger Shinigami who took them out in no time at all without breaking a sweat. As I already said, the faces Ikkaku pulled during his battle were nothing short of hilarious, I am actually disappointed I can only start the post with one picture as there are a couple of other deserving ones too. As for the actual fight, it was definitely the closest one between Shinigami and Xcution members, but Ikkaku still had little trouble, even telling Shishigawara that he was the worst opponent he could have fought and that he was out of luck. Hitsugaya meanwhile spent more time looking for Yukio than he did fighting him, he gave out the classic line about Yukio liking to talk too much, and then smashed through a wall with a swing of Hyourinmaru and the blast of ice that came with it. Yukio created some monsters using his Fullbring, but they were no match for Hitsugaya either. Meanwhile, Renji didn’t even want to fight Jackie because she’s a woman. Jackie asks if Renji has ever met a strong woman, but Renji says strength doesn’t come in to it, no matter what he didn’t want to hurt a woman as that’s the action of scum. Renji wouldn’t even draw his Zanpakuto against her, but Jackie attacked anyway after several warnings. Despite the attacks being strong enough to smash the giant boulders etc around the battleground, Renji easily blocked the attacks with his arm without taking any kind of real damage. After being attacked, Renji merely whacks Jackie in the stomach with the hilt of his Zanpakuto which leaves her conscious but unable to move. Renji then delivers the pretty cool statement about him having trained for the past 17 months to fight someone like Aizen, so in other words a challenge of this level was nothing in comparison. To Renji’s credit, despite Yukio trying to close down the game world with them both inside, thus killing his own teammate Jackie and Renji, Renji still refused to kill Jackie to save himself, instead saying he would use force to try and escape. Jackie though has seemingly killed herself so that Renji could leave, so that ended their battle. There are still a few battles to come in the shape of Tsukishima vs Byakuya, Ichigo vs Ginjo, and Rukia vs Riruka. We get to see these 3 battles at least look to start in this episode, but no attacks or anything of note happened, that will probably be saved for the next couple of episodes. That basically sums up what happened content wise, and it was pretty awesome. Ikkaku vs Shishigawara was surprisingly good, and the Shinigami came off as complete badasses with the way the made such light work of Xcution. Of course I can see why people would be mad about this since it’s basically trolling Xcution after all this build up, but at least take comfort in the fact the 3 remaining battles are all much harder and won’t necessarily go the Shinigami’s way. Next week looks to be focusing on Byakuya vs Tsukishima which I really can’t wait to see, and I wouldn’t be surprised if the next episode or two ends up being the best of the arc, so be sure to watch these few remaining episodes if you enjoy badass fights. As we approach the end of the Bleach Anime, it’s only right that these episodes turn out well so that it goes out on a high note. With episode 362 Bleach continues its run of brilliant episodes, and only makes the idea of no more episodes soon even worse. As we saw last week, Ichigo has restored his Shinigami powers with help from his old friends from Soul Society such as Renji, Rukia and Hitsugaya etc. This week, we begin to see why this means big trouble for the villainous Ginjo. After the sheer badassery of last week and Ichigo’s “attack” – which was in fact just him swinging his sword – I am sure most people were hyped to see how powerful Ichigo really is when he’s trying to hurt someone. Of course with his actual Getsuga Tensho he sliced a building clean in half, and then afterwards merely looked at Ginjo and apologised for missing his target, but told him that next time he wouldn’t miss. Ginjo wisely tries to escape, but as he flees Ichigo appears behind him and literally throws him back down to the ground. Ichigo is basically being badass and showing Ginjo who’s boss, but then Ginjo too enters a new form telling Ichigo that it will take more than those attacks to kill him (though he admits if he hadn’t stolen Ichigo’s powers then he would have died). We then find out from the Shinigami that before Ichigo there was another substitute Shinigami and that because of that person is why there are certain rules put in place now for them, and that substitute Shinigami was in fact Kugo Ginjo. Shortly after, the other Fullbringers arrive to back up Ginjo, although they intially come to ask he shares the stolen powers with them which they had agreed upon before, so Ginjo stays true to his word and shares some of the power with them all. Ichigo intially jumps down and tells the other Shinigami that since they are only there because of him, then he will be the one to take care of it. Ichigo then lets out one attack knocking all of the Fullbringers to the ground, with Ichigo saying it shouldn’t be enough to have killed them, just enough to stop them getting involved. Of course, this turns out to be a ruse as the real versions of the Fullbringers appear to attack Ichigo from behind, only to be stopped by Ikkaku. Ikkaku tells him that he can’t keep holding back, but then it’s shown that the Yukio he had apparently defeated was a fake too, but as the real one tried to attack Ikkaku was saved by Hitsugaya. Yukio then uses his Fullbring to create individual rooms for the Shinigami and Fullbringers to face each other one on one. Ichigo is put in a room with Ginjo, Ikkaku faces Shishigawara, Byakuya is paired with Tsukishima, Rukia with Riruka, Hitsugaya with Yukio, Renji with Jackie and lastly Kenpachi with Giriko. The only one we get to see in this episode however is Kenpachi vs Giriko, with Kenpachi annoyed that Byakuya got a stronger looking opponent than him. Giriko tells Kenpachi that he won’t forgive being called weak and uses his Fullbring – Time Tells no Lies – and (for some inexplicable reason) turns giant and green (the Incredible Hulk anyone?). Giriko claims his power is now massively increased and that he can’t be defeated, only for Kenpachi to take him down with one hit by literally slicing him in half, only then to say that he knew fighting Giriko was a waste of time. I really really enjoyed this episode, Ginjo being a previous substitute Shinigami was a nice twist and something that we should hear more about soon. The Kenpachi vs Giriko fight though was hilarious. In the Manga I remember being blown away by just how incredibly badass Kenpachi was to just shrug off Giriko like he was nothing and then take him out with one attack, but in the Anime I was too busy laughing about how they made Giriko turn in to an angry green giant, it really was hilarious just how much like the Incredible Hulk that part was! Aside from that though, the episode looked awesome, so much so that I was genuinely tempted to screencap about a dozen scenes just because they looked so damn good (in the end I settled for the Ichigo pic above and one near the end with Rukia and Riruka). But that leads to the next awesome thing, the upcoming battles between Shinigami and Fullbringers. 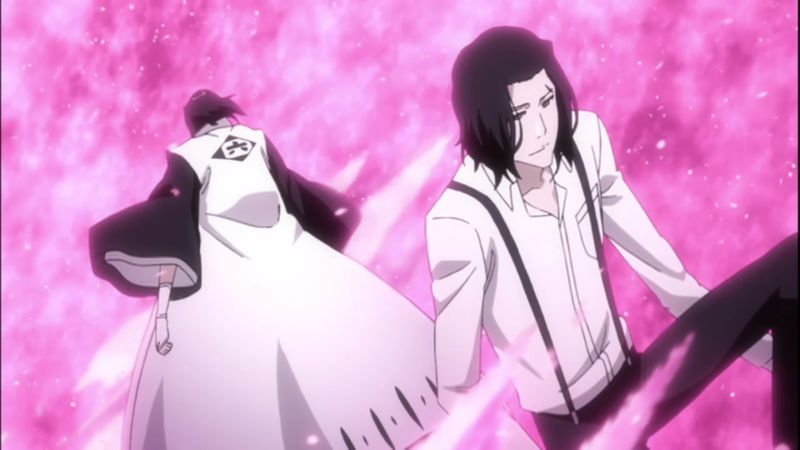 Without spoiling anything, don’t let the Giriko vs Kenpachi incident sour you on these upcoming fights as that was purely a one-off, the upcoming fights between the Shinigami and Fullbringers will last longer and won’t be so easy, plus the fight between Tsukishima and Byakuya is one of my personal favourites from Bleach, so you can definitely look forward to that. All in all this was yet another excellent episode from this arc and hits home how much I am going to miss Bleach once it is gone, but for those fans (like myself) who are sad to see it happen, rest assured that at the very least you are in for some brilliant episodes before it finally does come to an end. 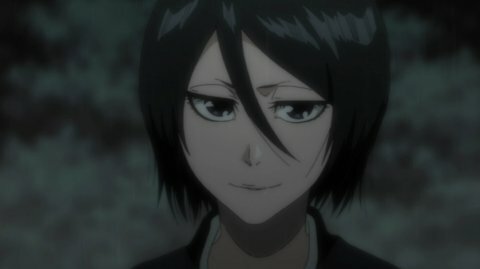 Bleach episode 361 was brilliant, there is no other way of describing it. When Bleach is still pulling out episodes of this quality it makes the fact it is being cancelled soon even harder to accept. But regardless, on to the review itself! Let me start by saying that I knew this episode would be great before I even watched it. Being a Manga reader I already knew what was coming, but this was still the part I was most looking forward to seeing being animated. As you can see, Rukia was sporting a new look in her return in this episode, and despite the return of the captains at the end being badass, at the end of the day I couldn’t resist using the Rukia pic what with her being one of my favourite characters from the series. But yes, this episode was fantastic. After last week when it looked like all was lost, the way Rukia returned alongside the other Shinigami (as well as Isshin and Urahara finally showing what they have been doing in secret all this time) to help Ichigo regain his powers and fight the cunning Ginjo was brilliant. Ginjo plays the role of a villain very well, after stabbing Ichigo through the chest and stealing his Fullbring, he shows no sympathy or compassion for Ichigo who at first is left helpless on the ground crying in anguish over all his hard work and desire to protect his friends coming to nothing. I love the scene with Ichigo clearly being emotionally overwhelmed at everything that has happened, and crying not through the pain of being slashed and stabbed by a giant sword, but instead crying over the anguish of not being able to protect those he cares for the most. That said, he does soon snap out of it, and despite being unarmed and having no powers, he still has the courage and determination to demand Ginjo give him his powers back. 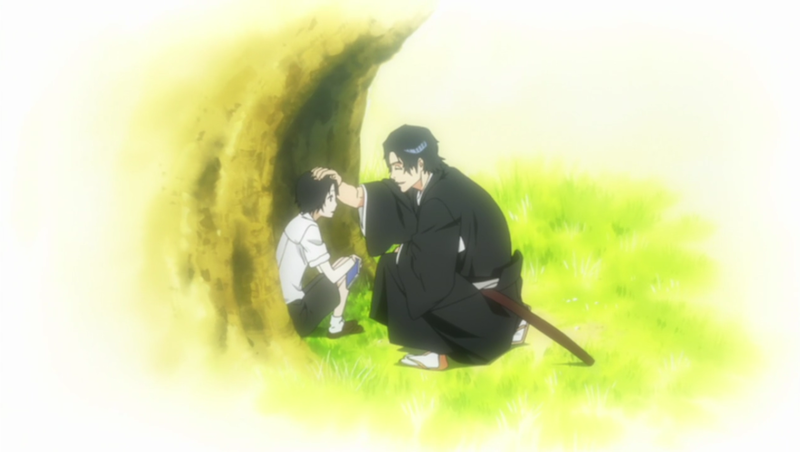 Obviously Ginjo doesn’t, but then when Ichigo is stabbed through the chest from behind by who he thinks is his father Isshin and Urahara, who he obviously assumes are betraying him too, it is such a damn brilliant moment when then he finds out that it is his old friend Rukia who has come and is actually helping him. 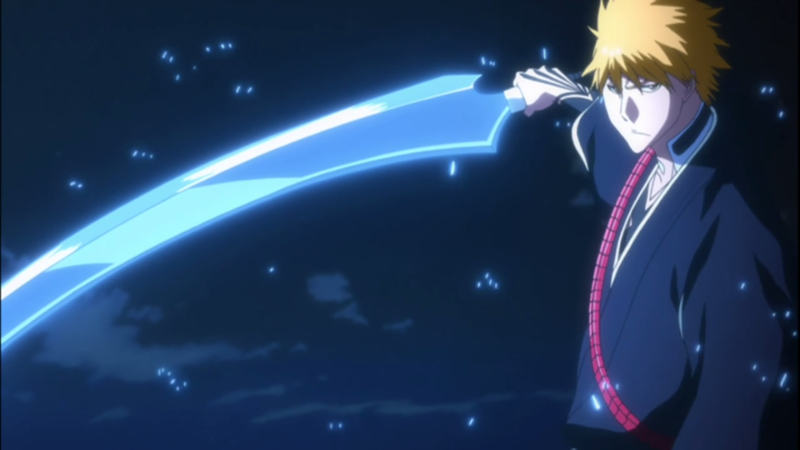 Then of course, Ichigo gets his powers back and also has a badass new look. In fact, most of the returning characters in this episode were looking a bit different to the last time we saw them. I personally love Rukia’s new look and hairstyle, but I know a lot of people didn’t when it was shown in the Manga, so feel free to leave a comment below on your thoughts on the new look characters. In the Anime it was worded slightly different, but it was so damn amazing all the same. A mere swing of his sword hurt Ginjo a lot and looked impressive, but then when Ichigo actually uses Getsuga Tensho and slices the mansion in half (as well as slicing through all the clouds in the sky) was one of the most truly epic things ever seen in Bleach as a whole. If you like Bleach, watch this episode. If you have only read the Manga version, watch this episode at the very least. And if you’re a fan of any of the Shinigami Captains, you have to watch this too. This was a truly fantastic episode and one of the best episodes in Bleach I can remember, so if you ever were (or still are) a fan of Bleach, or Shonen series as a whole for that matter, then do yourself a favour and check this episode out asap. I have had quite a few requests of late to start reviewing the Bleach Anime like I have with Naruto, so while I was originally planning on waiting for the arc to end and do a review of it as a whole, I instead changed plans to do weekly reviews instead. So then, how was the offering this week for the Bleach Anime? But as for the review itself, let me start by saying I really enjoy the Fullbring arc. I have already read it in the Manga and for the most part I found it excellent, and the Anime has so far done a good job with the episodes too, this one being no exception. In recent weeks we have seen Ichigo suffer the anguish and torture of seeing all his friends suddenly helping Tsukishima, while at the same time getting annoyed with Ichigo for attacking him in the first place. Of course they are only doing it because of Tsukishima’s Fullbring ability “Book of the End” which allows him to insert himself in someone’s past if he manages to cut them with his sword. Eventually it was down to just Ichigo and Ginjo who hadn’t been hit with that Fullbring, and thus were going against everyone else Tsukishima assembled. I really like the way the Anime has handled the surprise betrayal from Ginjo, the laugh from Ginjo was done brilliantly, and all of a sudden after being Ichigo’s ally for so long to then turn in to his enemy and do such a convincing job was great. I obviously don’t want to say much more than that because it would end up as being spoilers, but Ginjo’s deception was handled very well and has left Ichigo in a dire situation. I also advise skipping the preview for the next episode, as quite honestly I immediately noticed them giving something away that will no doubt annoy someone who doesn’t already know what is to come. But this episode was pretty awesome and done well, the tone at the end of the episode fit really well and the soundtrack choices were spot on too. For anyone this far in to Bleach then no doubt you will end up watching the next episode regardless, but with what is to come let me tell you that watching on from here is a must if you want to see not only some brilliant moments, but also if you have a care at all for the storyline. Overall this was a fine episode, and is one you should be sure to check out if you are a fan of the usual turns and battles Bleach throws out. You are currently browsing the archives for the Bleach Anime Reviews category.